Perfect for a high end home theater. Highly sought after by movie poster collectors and aficionados. Get notified of our AUCTIONS & NEW INVENTORY instantly! S One Sheet ORIGINAL MOVIE POSTER issued by the studio when the film was released and meant for theatrical display. This is a vintage original poster from our archives. This poster is NOT FRAMED. We do offer custom archival frames for an additional cost U. These can be very difficult to find in any condition! A long time can go by without one of these coming up for sale. You will have trouble finding a nicer one. Not in perfect shape but still very presentable. No tears, no tape, no pin holes. Very little general storage wear. If a vintage poster is in terrific unrestored condition like this one (EX C8 or better), many experienced collectors will place a premium on it (when compared to a linen backed/restored one). Most experienced collectors prefer unrestored items to restored ones because they believe they will appreciate more in value. This poster is considered to be within that class and is definitely INVESTMENT QUALITY. A perfect candidate for Linen Backing, although it is not necessary as this poster displays beautifully as is. Linen Backing preserves and can actually increase the value of a poster. For the most part, any flaws will be fixed and the poster will appear to be in Near Mint condition. For more information about our. We do not always measure all of our posters exactly. Unless otherwise specified, poster measurements quoted above are approximate to the nearest inch. For example, if we say a one sheet poster is 27" x 41" its precise measurements may be closer to 26 3/4" x 40 7/8" (or something similar). This slight variance is quite common for all original movie posters. BEWARE OF "FAKE" MOVIE POSTERS! There are fakes, bootlegs, reprints, and reproductions of almost every popular movie poster. Most are from popular movies from the 70's and 80s, but there are also really old ones and relatively new ones as well. They usually appear in insert size 14" x 36" and one sheet size 27" x 41". Again, all we can say is BEWARE! We grade our posters according to the Iguide Universal 10-Point Movie Poster Grading Scale. Almost all of our inventory is graded at least C8 Excellent or better. Pin holes, small tears, etc. C7 Very Good to Excellent - Fine. Still a very nicely preserved item. C6 Very Good - The typical used poster in average condition. We can yield for you MUCH MORE than you would get if you auctioned them yourself up to TEN TIMES or more! Let us sell your posters for you! For more information about CineMasterpieces please see. We guarantee that all posters we sell are graded and described accurately. Unless otherwise specified in the description, ALL POSTERS ARE ORIGINAL MOVIE POSTERS original theatrical movie posters that were displayed or meant for display (unused) in theaters at the time the movies were released. We will put in writing that we guarantee it to be an Original Movie Poster. 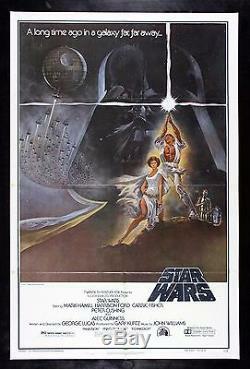 The item "STAR WARS CineMasterpieces NO RESERVE ORIGINAL MOVIE POSTER 1977 DARTH VADER" is in sale since Saturday, January 14, 2017.